Eisenhower Method: the method enables you to organize tasks in order to figure out priorities. 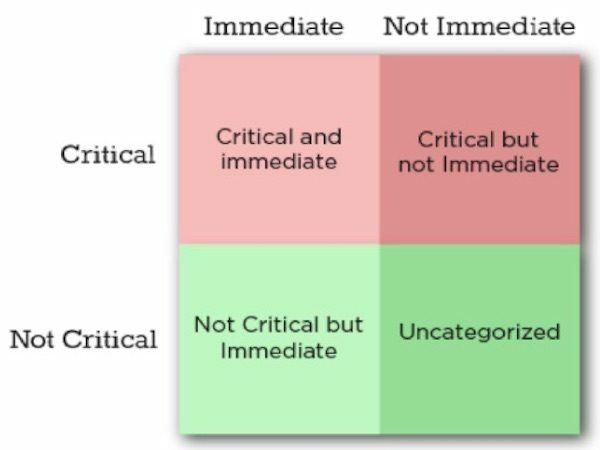 General Eisenhower is quoted as saying, “What is important is seldom urgent and what is urgent is seldom important.” That led him to ‘invent’ his matrix for distinguishing the urgent and the important. The entrepreneur often can make such distinctions without resorting to any tool, but some of us mortals need a little help. The Eisenhower Method is is useful time management tool for getting things done, rather than being immobile when confronted with tough decisions on how to make the most productive use of time. Setting up a new venture confronts the entrepreneur with tough choices. Hunch sometimes works, but using the Eisenhower Method makes work of the hair-raising startup process a little bit easier. The Eisenhower Method is something you can do on your own, but you will find that it is often more effective in a group. You do not have to use it in a formal way, though of course you can. It can always be used as a guide to the way you approach decision issues. Try it! If you consider that time management is your Achilles Heel is time management, then I strongly advise a trip to the Small Business Administration’s Time Management for a Small Business, which includes help on the Eisenhower Method. It will not take too much of your time (!) and the payoff is likely to be significant. Have a look at my own set of Helpful Tools, since there are others that may save you time, too.